BEM™ is available in different configurations like the simple Hand Scanning Kit (HSK) to complex remotely operated submersible devices – applicable to any diameter or shape. You can engage the full range of specialised services, rent/buy the equipment or become a licensee. Certified training also available. There are numerous benefits and advantages of BEM™ over other technologies for measuring wall thickness. BEM™ calibration is not required prior to commencing scanning at each site location. It utilises existing databases that are an integral part of the proprietary MetCon© software and covers wall thicknesses up to and beyond 25mm / 1-inch for a number of pipe materials including Mild Steel, Ductile Iron and Cast Iron. BEM™ technology works by emitting a discrete electromagnetic signal, which interacts with the target material, be it a tank, pipe, or other engineering structures. BEM™ covers wall thicknesses up to and beyond 25mm / 1-inch for various ferrous pipe materials based on the sensor selection. BEM™ has the capability to provide wall thickness measurement accuracy of +/-3mm / 0.04-inch (+/-1mm / 0.12-inch for thick walls). BEM™ is not limited by the diameter of the pipe. Other shapes, including elbows and tees, can also be scanned. BEM™ can be conducted through thick coatings or linings, including paint, coal tar, and cement mortar lining. BEM™ is not frequency-dependent, so there is low likelihood of outside stray current fields contaminating the resulting data. BEM™ gives a continuous contour plot of wall thickness over the scan area. It is also a truly non-destructive method, as it doesn’t require the removal of linings or coatings for inspections and subsequent refurbishment. 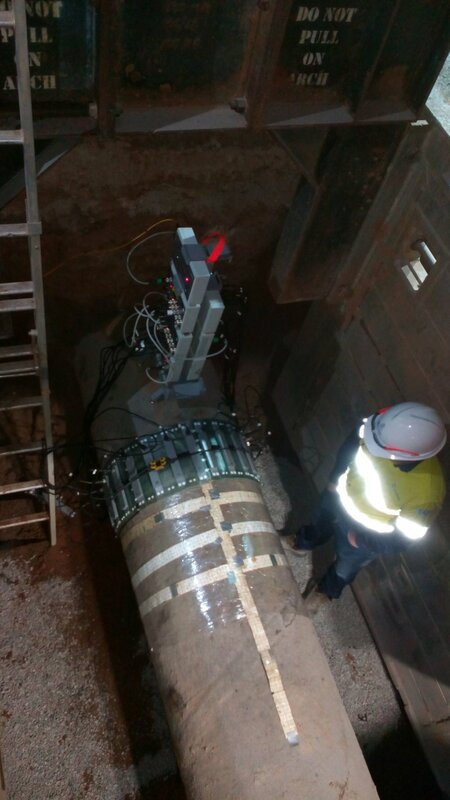 Rock Solid Group has BEM™ tools for both internal and external scanning for pipes from 100mm / 4-inch to beyond 2.4 metre / 96-inch diameter pipelines. For large pipe wall or tank scanning areas, often an initial BEM™ Broad-Brush scan will be followed by either further partial circumferential Broad-Brush or High Definition patch scan(s), if areas of interest have been identified onscreen during the Broad-Brush scan and on-site Edit Parameter analysis. The HSK HD12 / 1 (High Definition 12mm / 1-inch multi-sensor) antenna may be utilized for scanning around bends or hard to reach locations and/or any degraded cement-mortar lining sections. An optional HD12 / ½ (High Definition 12mm / ½-inch multi-sensor) antenna & cable can then be utilized to rescan any “hotspot” patches of interest, that were identified on-screen, in real-time and post scan edit parameter analysis. In addition, a cross-correlation using UT will be available.